I don't remember exactly where these photos were taken, but it was down in Southern California somewhere. And I know at least a couple of the photos were taken by Paw Prints Photography (or something like that) down there. I am trying to remember the woman's name. Nice nice person. Anyway ... here's a few of the shots she took. And here's a few more. A couple of these you might recognize from calendars and magazines over the years. I have scans of the magazines somewhere also, maybe I'll drag them up at some point. Looking back at these photos reminds me of how long I've been working with Zip. 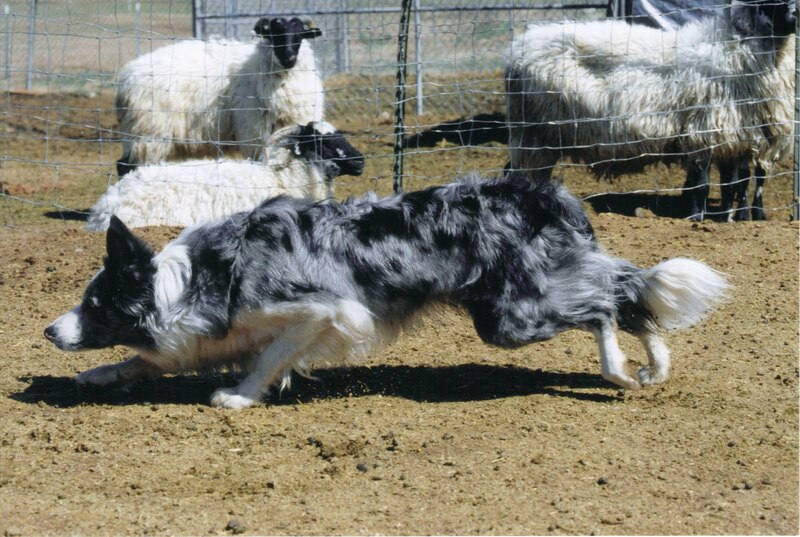 The other day, I was out moving my sheep literally across my driveway from one pasture to the other ... dogless. You'd think this was a simple chore. 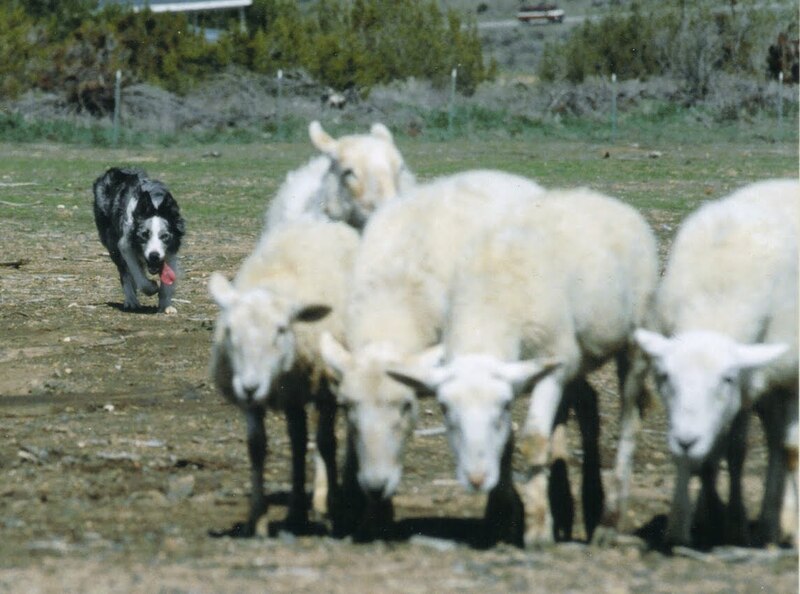 Sure ... all the sheep came through, except the two lambs couldn't figure out how to negotiate the gates, so Momma was very patient and kept going back to pick them up, and then continually ended up on the wrong side of the gate somehow. I finally decided I needed to leave my post and get behind the lambs, which leaves a little gap for sheep to squeak out of if they wanted to. And they did. 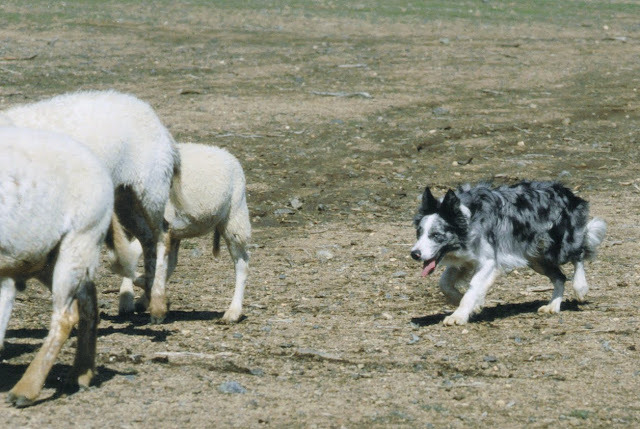 While I was helping the lambs, one of my yearlings decided it would be fun to go explore, which caused several others to follow, including the two little lambs I was trying to help. I got everyone back in, except for one of the littlest lambs, before giving up and going and getting a dog. He looked at the situation, went alongside the road, got behind the lamb, brought the lamb to me, I opened the gate, he put the lamb with Momma, then he picked up all of the sheep and moved them from one pasture to the other, and even when the sheep went into the big pasture, Zip stopped at the gate, and stood there while I closed it and patted him affectionately. It took him about 30 seconds to accomplish what I was messing with for at least 15 minutes. And I never said a word to him. 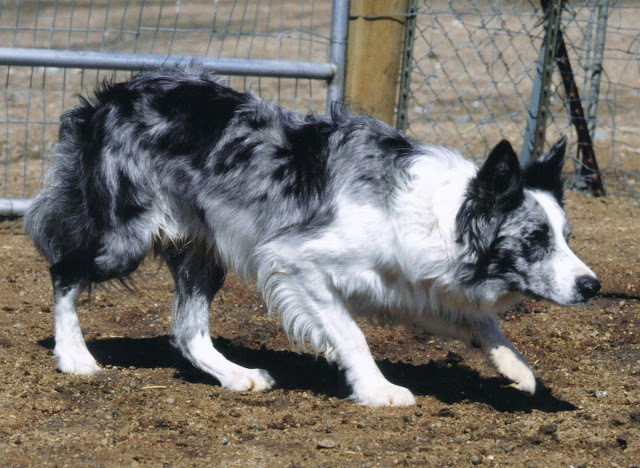 There exists such a prejudice against colored Border Collies, that even when they are good working dogs, they are discredited. People seem to want to hold them to a higher standard than they would a black dog, and at the same time, they seem to give some black dogs credit where it really isn't due. 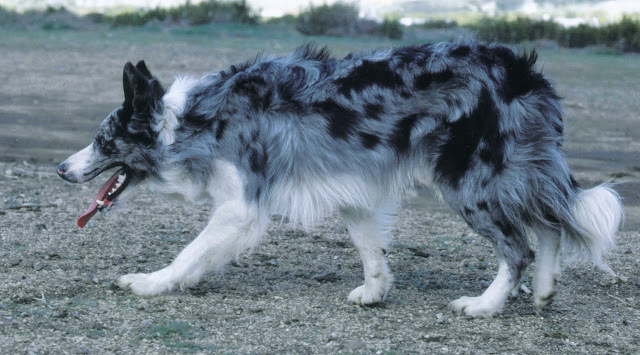 I feel very fortunate to own a very nice working blue merle. Sure, in the grand scheme of things, this was a very simple task, however, it was done completely by him with no direction from me, and done for me. He's been a great teacher, very patient with my less-than-stellar handling, and has turned into a great dog despite ... well ... me. 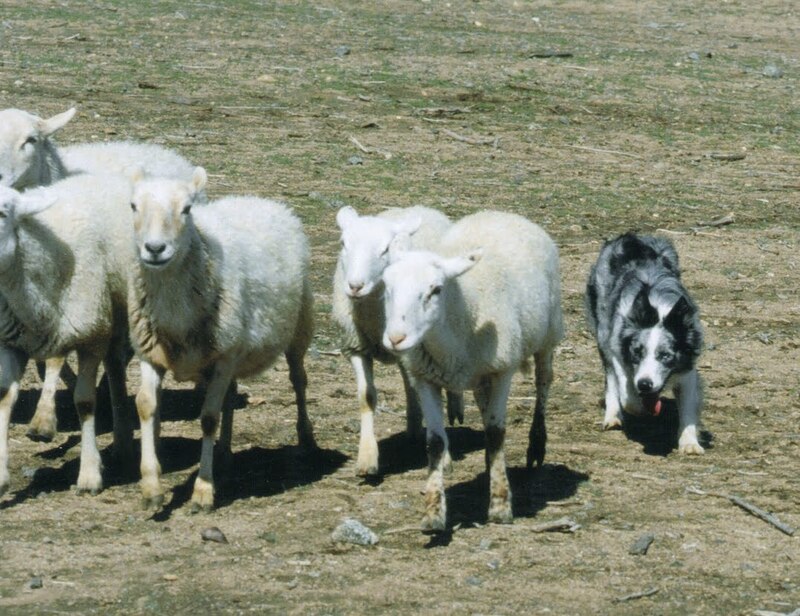 I know I can trust him in any situation I put him in, and he will get the job done, and none of my sheep will be worse for the wear. We've been through a lot together, and the complete mutual trust of each other is something built over time ... and simply amazing when you have it. How's that for a sappy trip down memory lane? Zip is a gorgeous dog and a credit to the breed. I think the merles are getting more popular, certainly amongst the people I know. 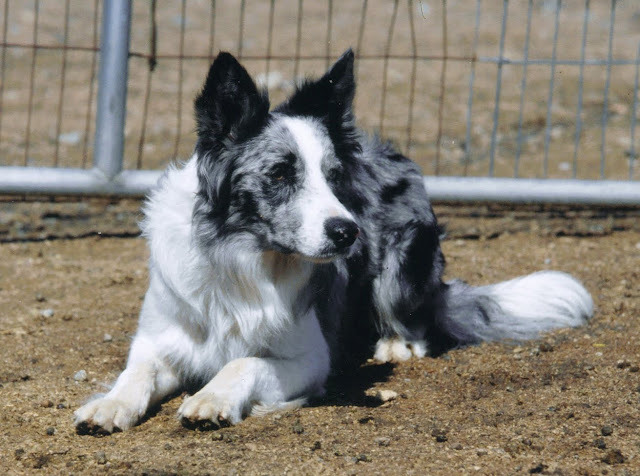 Beautiful Blue Merle Border Collie in Idaho!